The last thing you need to worry about is car or tire trouble. That's why Tire Pros offers the industry's strongest warranty package featuring complimentary roadside assistance. Now you can Drive with Confidence…knowing that where ever you go we're with you. Anytime. Anywhere. No matter how strong we back the products and services we deliver, tires and vehicles will inevitably fail. That's why you need a true professional and a trusting partner with a warranty package that's simple, hassle-free and honored at over 30,000 locations. Nobody protects you like the Pros. We are the largest network of elite, independent tire dealers with an industry-leading warranty package to protect your family. Anytime. Anywhere. With Tire Pros Complimentary Roadside Assistance, we're here to help you regardless of the time of day, weekends or holidays. Our hotline is open 24 hours a day, seven days a week, 365 days a year in both the United States and Canada. Nobody protects you better than the Pros. 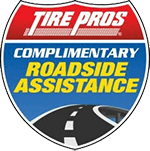 No matter what service or item you purchased at any Tire Pros location in the country, you'll receive Complimentary Roadside Assistance. This includes 3 detachable Roadside Assistance cards valued at $100 each (see image below) - good for one year and can be renewed every year for free. Every retail customer of Tire Pros, who has had work performed at one of our stores, is protected. No question about it. Our Nationwide Service Warranty guarantees that the work we perform on your family vehicle is done right and with the utmost care and craftsmanship. And if in the unlikely event that something does go wrong with something we did, we'll get it fixed. The best part is our Nationwide Service Warranty is true to its name. 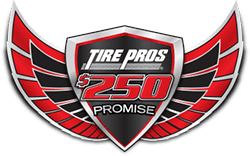 It's accepted at 30,000 locations around the country - not just the 500+ Tire Pros stores nationwide. Anytime. Anywhere. Tire Pros protects you. 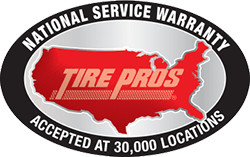 Tire Pros' Nationwide Service Warranty is also known as the "Service Protection Plan" or "Coast to Coast" plan in certain markets. Make no mistake about it, tires are a major investment and you will likely have to purchase at least 3 sets during the life of your vehicle (which varies by driver, of course). With all that back and forth driving to work and soccer practice in a given year, it makes sense to protect your tire investment from road hazards - and Drive with Confidence. *Pricing varies by location (commonly 10% of the tire price). **Valid at Tire Pros locations only. Trust us…any tire, no matter how well constructed, may fail as a result of punctures, impact damage or other road hazard conditions. "It," however, never fails. "It" being the moment you say "no thanks" to our Tire Protection Plan and then hit that construction nail down the street. 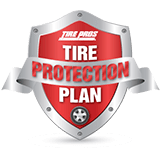 Avoid the hassle and protect your investment with the Tire Pros Tire Protection Plan. This is our way of backing up our work and our network of 30,000 locations that accept our warranties. It also ensures that you have a hassle-free experience with Tire Pros. It's our promise to you. If your car is disabled and you have either the National Service Warranty ("Coast to Coast") or Tire Protection Plan ("Freedom Plan") and you can't find one of the 30,000 service stations within 25 miles…we'll give you $250! Obviously, we're pretty confident in our warranty package and our network of 30,000 dealers. We hope you never have to use either one of our warranties, but it's nice to know you have a partner by your back. Nobody protects you like the Pros. Nobody.